SEOUL, South Korea — Almost $7 billion was wiped off smartphone giant Samsung Electronics Co Ltd's market value Thursday after it delayed shipments of its Galaxy Note 7 amid reports of exploding batteries. Faults with the new flagship device could be a major blow to the South Korean firm. Samsung was counting on the Galaxy Note 7 to maintain momentum against Apple's new iPhones — which are expected to be unveiled next week. "This is some major buzz-kill for Samsung, especially given all of the hard-earned excitement that products like the Note 7 have been garnering lately," IDC analyst Bryan Ma said. "The timing of this couldn't have been worse." The phone launched in South Korea and other markets on Aug. 19. Sister company Samsung SDI Co Ltd said that while it was a supplier of Galaxy Note 7 batteries, it had received no information to suggest the batteries were faulty. Several people posted images and videos of charred Galaxy Note 7s online and said their phones had caught fire. The model retails at 988,900 won ($887.23) in South Korea. 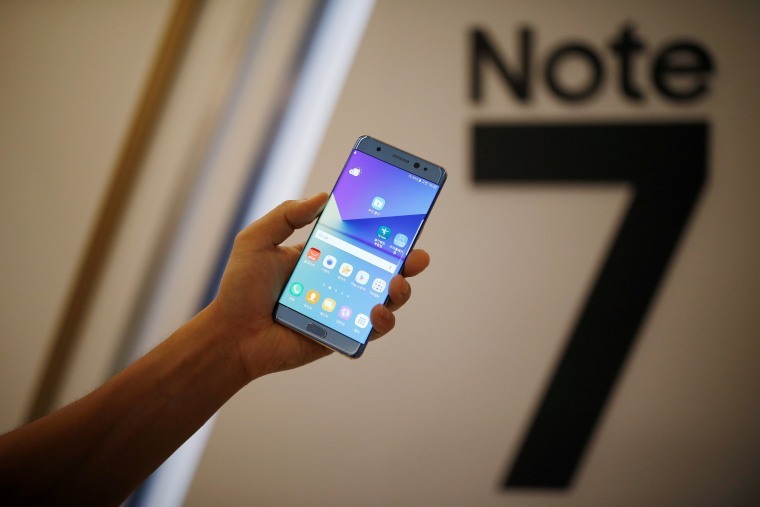 Hyundai Securities said in a report that the Galaxy Note 7's problems should be resolved within a "few weeks."